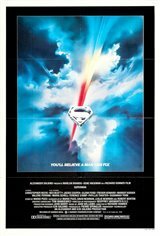 Richard Donner's big-budget blockbuster Superman: The Movie is an immensely entertaining recounting of the origin of the famous comic book character. Opening on Krypton (where Marlon Brando plays Superman's father), the film follows the Man of Steel (Christopher Reeve) as he's sent to Earth where he develops his alter-ego Clark Kent and is raised by a Midwestern family. In no time, the movie has run through his teenage years, and Clark gets a job at the Daily Planet, where he is a news reporter. It's there that he falls in love with Lois Lane (Margot Kidder), who is already in love with Superman. But the love story is quickly sidetracked once the villainous Lex Luthor (Gene Hackman) launches a diabolical plan to conquer the world and kill Superman. Superman: The Movie is filled with action, special effects and a surprising amount of humor.